Construct Wu’s huge ninja training base, Destiny’s Bounty. 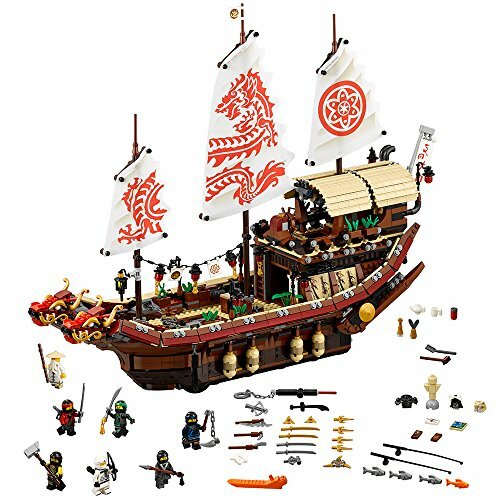 This highly detailed THE LEGO NINJAGO MOVIE model consists of 3 modular levels and features a double-headed dragon figurehead, decorated sails, wind-up-and-release anchors, dojo area for ninja training, a bathroom and Wu’s bedroom in the hull. This amazing model also includes hidden weapons including the ultimate weapon – the laser-style pointer, plus 7 minifigures with assorted weapons to bolster the exciting role-play possibilities.